In the weeks leading up to the royal wedding, everyone predicted the bride’s bouquet would include a lot of garden roses and peonies, but it certainly didn’t, and I love that it was simple and classic but also trendy and unique. As the floral merchant for SamsClub.com, I see thousands of floral orders come in every week. 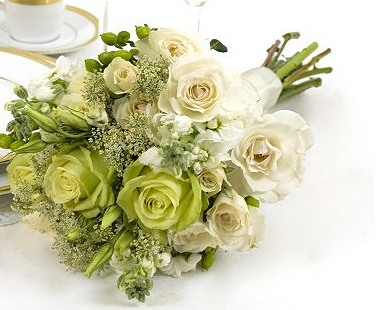 Most bridal orders include roses - usually white or pink - hydrangeas, baby’s breath and some sort of green filler, which all come together beautifully and allow brides to create elegant, classy arrangements. My favorite part about the royal wedding bouquets was the natural, earthy feel. This is a huge trend for weddings this summer, and I like to call it "the wildflower look." The royal wedding bouquet featured flowers handpicked by the groom - how sweet is that? The arrangement included forget-me-not, lily of the valley, astible, jasmine, astrantia and the royal tradition, myrtle. 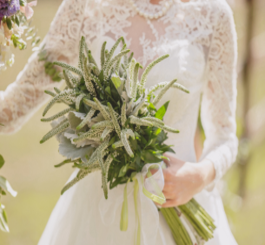 What many brides may run into while trying to re-create this look is that a lot of these flowers are very seasonal and hard to come by here in the U.S. Also, the flowers for the royal wedding were rumored to cost more than £110,000, so price may also make this a difficult look to achieve. For perspective, the average American wedding costs just under $31,000 and flowers are usually about 7% of the total spend at just over $2,000. Don’t be discouraged - Sam’s Club can help you create arrangements inspired by the royal wedding that won’t cost you the crown jewels! I’m going to share three ways you can get a similar look for much less than the $2,000 most American brides spend on flowers. In fact, my best tip for saving on flowers for your wedding is to buy them in bulk and use your DIY skills to build your own bouquets. It will save you a lot of money! 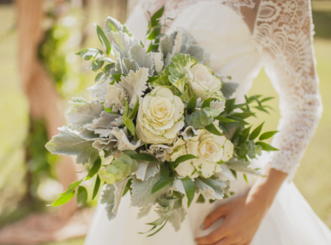 To make this bouquet, we used Veronica, Dusty Miller and Italian Ruscus. I rated the DIY level on this as easy because it’s only three flowers you’re pulling together into a simple bouquet. Just hand-tie with ribbon and you’re good to go! DIY Level: None – it’s premade! If DIY isn’t your thing, then our green and white wedding collection is the best option for you. Our wedding collections arrive pre-made so there’s no DIY work needed. Think of it as a wedding in a box as the flowers are ready to go when they arrive. We offer several options of the green and white collection online ranging from a 2 piece collection up to a 43 piece collection.